Hello and welcome back to my blog. Today I have a card using Penny Black new release stamp set and some of their older dies. I decided to do some colouring on my card after seeing Kathy Mac’s day one 30 Day Colouring Challenge video of adding shading with distress inks. I used Penny Black’s Leaves die set to die cut on white scrap cardstock. Leaving the dies in place, I coloured them with four different shades of green copic markers. Then I added shading using Gathered Twigs distress inks and sponge dauber. 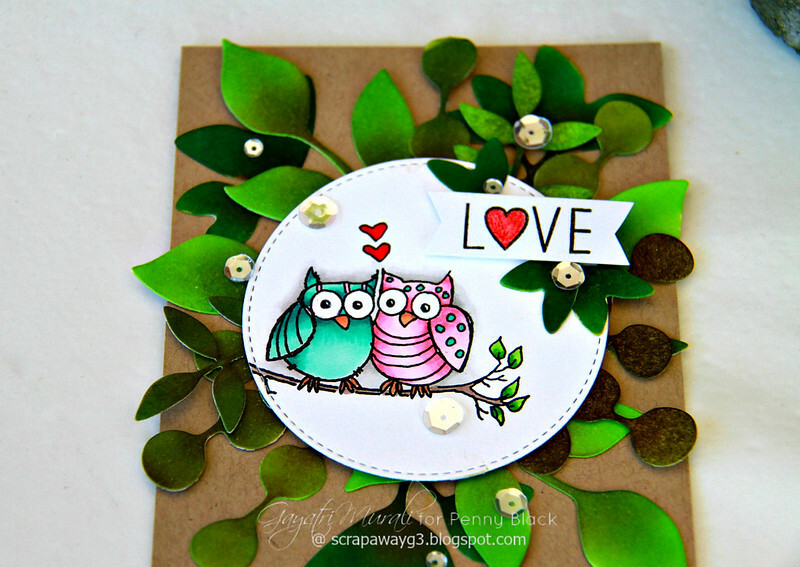 Then I picked up a stitched circle die cut I had in my stash to stamp this cute image of owls from the new Critter Love stamp set also from Penny Black! I coloured them using copic markers and also added shading around the image using cool grey copic markers. The shading makes the coloured image pop out. I then stamped the sentiment from the same stamp set on a strip of white cardstock and trimmed fish tail banner on both sides. To assemble the card, I chose kraft card base. I love to pair green colours especially green leaves with kraft cardstock. The combination gives a more organic and earthy feel. I adhered the circle die cut with the coloured image of the owls on the center of the card front sing foam adhesives. Then tucked the coloured leaves die cut around the the circle die cut. I adhered only the end of the leaves die cut under the circle die cut so that the the die cuts card be layered and raised to give dimension. I foam mounted the sentiment strip on top right of the circle. Coloured the heart in the sentiment using red glitter pen. To bring the card together, I added Pretty Pink Posh’s Sparkly Clear sequins mix. Here is the Critter Love stamp set and Leaves die set from Penny Black I used on the card. Beautiful coloring!!!!! Love the distress ink coloring Kathy shared! Thank You for sharing your coloring for The Daily Marker 30 Day coloring challenge. Great card. Love all your leaves.